The last Lois Ehlert book I read to Arya ranks as one of the best baby books I have seen thus far. Planting a Rainbow by Lois Ehlert is designed in the same style as Eating the Alphabet, but somehow a book about pretty flowers is less appealing than a book about yummy food. Of course I might be biased since I rather eat food than look at flowers, but it is much harder to find useful lessons in Ehlert’s book about flowers. Whereas we can use Eating the Alphabet every time Arya tries a new fruit or vegetable, it is unlikely she will see most of the specific types of flowers in Planting a Rainbow. Part of the problem may be that I couldn’t even pronounce, much less identify, some of the flowers in the book. Horticulturalists might be able to teach their children using Planting a Rainbow, but as city-dwellers in a small apartment, we won’t be showing Arya a blue hyacinth or purple phlox any time soon. 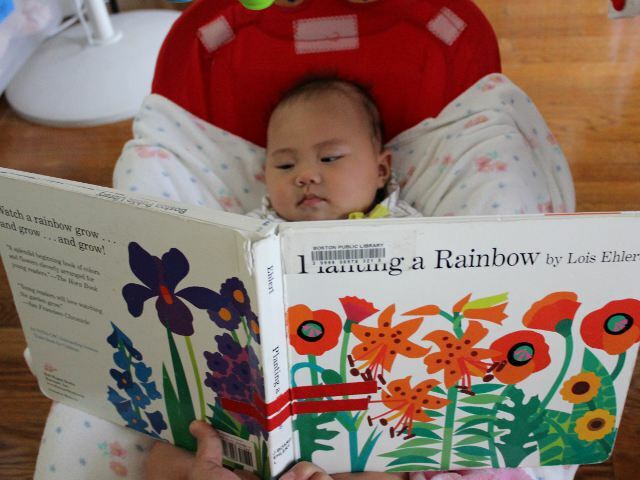 Utility of the book aside, Planting a Rainbow is a great book for young children. Arya loved looking at the different colors on each page. She really enjoyed the special fold-out pages which each focus on one color of flower. I have no doubt the illustrations are realistic, but I have no way to tell what asters or zinnia are supposed to look like. I did recognize the rose and tulips by sight without needing to rely on the small text beside each flower species. Planting a Rainbow begins with a introductory story before the individual pages on colors of flowers. The story is nice for parents intending to teach children about planting and gardening, but I would have preferred the entire book to focus on flowers of different colors. I would highly recommend the larger, but more expensive, hard cover version of the book. While the smaller board book has the same information, Ehlert’s drawings come alive in the huge hardcover and make it far easier for both adults and children to use the book to identify plants in real life. Planting a Rainbow costs (including shipping) $6.95 new and $3.99 used for the board book and $12.41 new and $4.99 used for the hard cover.